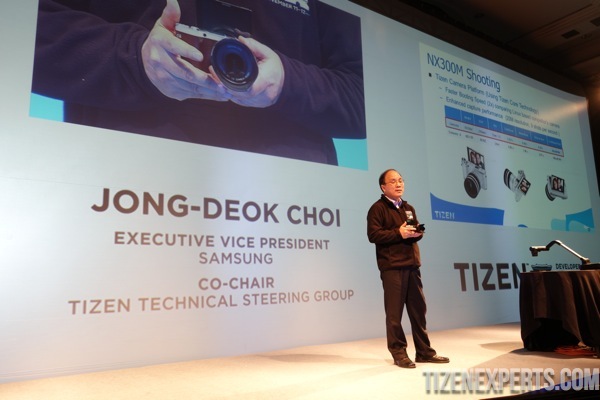 Shipping Samsung NX-300M Mirrorless Camera is Actually Tizen !!!! Tizen holds the promise on shipping on lots of different devices. Samsung has already been shipping the Samsung NX-300M (NX300M) Camera for the last month or so but Today at the Tizen Developer Summit, Samsung has officially announced that this camera is actually running Tizen !!! Previously we have been investigating the Samsung NX Cameras and did find some Tizen references in the Firmware but its now official. It carries a 3.31-inch AMOLED touch display rotatable 180 degrees, 20.3-megapixel APS-C sensor which can take 9fps continuous shooting, 100-25,600 ISO range. In Korea you can grab one for 890,000 won (about $839). Keep tuned and well get you some more information ….